Investments in natural capital are largely about promoting actions to protect, restore, and enhance natural assets and the associated flow of ecosystem services they provide by accounting for their value in the economy and to society. Photo: ADB. Natural capital has been a key contributor to the Greater Mekong Subregion’s rapid economic growth over the past 3 decades or so. However, the subregion’s key natural capital stocks are in a state of decline. This is evident by the degradation of arable land; considerable losses in forests, wetlands, and mangroves; and many species of fauna and flora becoming endangered or even extinct. The Greater Mekong Subregion (GMS), which comprises Cambodia, the People's Republic of China (specifically Yunnan Province and Guangxi Zhuang Autonomous Region), Lao People's Democratic Republic, Myanmar, Thailand, and Viet Nam, is poised to continue developing at a significant pace. The subregion is well placed to benefit from the Association of Southeast Asian Nations Economic Community because of its strategic geographic positioning, extensive subregional connectivity, and strong sense of community established through more than 2 decades of subregional cooperation. The GMS Regional Investment Framework 2022, comprising a pipeline of prioritized projects requiring $66 billion in estimated financing, is indicative of the subregion’s development potential. However, the sustainability of the subregion’s future prosperity could be undermined unless the GMS invests significantly more in safeguarding and enhancing its natural capital. Indeed, in the context of the subregion’s vulnerability to climate change, natural disasters, and human-induced shocks, investments in natural capital present some of the most economically viable and socially inclusive adaptation and resilience strategies. Investing in natural capital will greatly help the GMS realize inclusive and sustainable development. This policy brief was adapted from a 2015 report, Investing in Natural Capital for a Sustainable Future in the Greater Mekong Subregion, from the Asian Development Bank. Natural capital includes forests, agricultural land, atmosphere, ocean ecosystems, and minerals. These resources provide a number of services (often referred to as ecosystem services) essential to the survival of humans, such as source of food, water, energy, and shelter. Natural capital, which accounts for 20%–55% of the total wealth of GMS countries, has been a key contributor to the rapid economic growth achieved in the subregion in the past 3 decades. Agriculture (including forestry) makes up about 30% of gross domestic product (GDP) in Cambodia, the Lao People’s Democratic Republic (Lao PDR), and Myanmar, and is the main source of employment in the GMS, engaging between 38% (in Thailand) and 74% (in the Lao PDR) of the labor force. The Mekong River supports the world’s largest inland fishery, with annual turnover of $1.4 billion–$3.9 billion. Natural capital also sustains the manufacturing and service sectors—such as the thriving furniture industry in Viet Nam, the world’s sixth‑largest exporter of furniture, and tourism, which contributes about 17% of GDP in Yunnan Province, the People’s Republic of China (PRC). The GMS is highly vulnerable to climate change, particularly in its extensive low-lying coastal areas, which are also among the world’s most productive agricultural lands and fisheries. Projections of temperature and rainfall under climate-change scenarios suggest that critical thresholds for many crops in the Lower Mekong Basin will be exceeded by 2050. Ecosystems, such as watersheds, wetlands, mangroves, and coastal dunes, provide invaluable regulatory services that buffer the effects of extreme weather events, such as storms and droughts. Historically, rural communities have depended on nature (e.g., forests and wetlands) for subsistence as part of strategies for coping with and recovering from natural and human-induced shocks. Natural capital is a crucial component of rural livelihoods. More than 60 million rural people rely directly on it for their daily energy, food, water, and income needs. Fisheries provide 47%–80% of animal protein consumed in the GMS, and more than 80% of Cambodian and the Lao PDR households depend on biomass for cooking and lighting. A significant decline in ecosystem services would directly affect the energy, food, and water security of these populations. Land, water, and soil degradation, and the associated reduction in agricultural yield, could drastically lower the earning capacity of vulnerable groups, such as the rural poor and women. Many nations including the GMS countries have pursued economic development strategies that rely on the intensive use of natural capital. Such development strategies typically undervalue the contributions of natural capital to human well-being and treat ecosystem services as economically invisible. This approach has led to the overexploitation of natural capital and the degradation and destruction of arable land, forests, and water resources. For example, the overuse of pesticides and chemical fertilizers in agricultural production has severely degraded groundwater and reduced soil fertility and crop diversity. In the PRC’s Yunnan Province, about 47% of available grazing land is classified as moderately to severely damaged. Wetlands—among the most diverse and productive ecosystems in the GMS—are also severely threatened by land conversion, water withdrawal, and dam construction. Less than 2% of the original area of natural inland wetlands in the Mekong Delta is intact. Between 1990 and 2010, the GMS (excluding Viet Nam) lost more than 12.5 million hectares of forest, or almost half of the total area of the Lao PDR. Natural-capital losses in the GMS are valued at 10%–12% of GDP per year. If current trends in cosystem loss continue, forgone services in the next 25 years could cost the subregion an estimated $55 billion. Several key drivers are exerting further pressure on natural capital in the GMS. First, economic growth is expected to continue, thus increasing the demand for food, energy, and water, and could hasten the depletion of natural capital. Second, consumption patterns in the subregion are shifting as a result of a more affluent society as well as a rapidly increasing urban population, creating additional pressure on natural capital. For example, diets are changing from predominantly cereal-based to increasingly protein-rich, which intensifies pressure on farmlands. Urbanization increases the demand for key ecosystem services such as energy, water, and construction materials. Third, climate change will place added pressure on natural capital in the GMS. Agricultural assets, including land and water, are highly sensitive to a changing climate. Agriculture yields in the subregion could decline because of extreme temperatures, the intrusion of saline water into croplands due to rising sea levels, increased drought and flooding, and the effects of wind and soil erosion. Policies and programs to support the protection and management of natural capital must be more cohesive and complementary to be effective and efficient. Natural-asset policies mainly focus on establishing and managing protected areas. Only limited actions have been taken to minimize the impact of economic activities on natural capital, such as the use of strategic environmental assessments. Natural-capital related policies often lack robust legal underpinning, and their implementation is not always mandatory. Legal systems and monitoring and evaluation processes must be put in place or improved for policy implementation to succeed. Similarly, there is a need for greater coordination among international, regional, and national actors to achieve policy objectives under related global agreements. These include the Aichi Biodiversity Targets, the United Nation’s climate change targets, and the Sustainable Development Goals. Some GMS countries have begun institutional reforms to give greater authority to environmental agencies, consolidate their functions, and improve coordination with other sectors. Other countries have yet to do so, however. Official development assistance and conservation projects traditionally funded by governments are the main sources of investment in natural capital. GMS countries are also exploring innovative fiscal instruments, such as environmental taxes and incentives, and market-based mechanisms, such as payments for ecosystem services. Greater uptake of such approaches will ensure sustainable investment in natural capital. To achieve the required financial, institutional, legal, and policy reforms, the value of natural capital must receive greater recognition at the political level. There is a large and growing body of information about the value of natural capital in the GMS, but national-level frameworks, such as natural capital accounting, are only starting to be applied. Lack of technical and institutional capacity presents another challenge to scaling up investments in natural capital in the GMS. A natural-capital approach is the economic reflection of the value that natural assets and services contribute to human economies. It represents a fundamental shift away from traditional approaches to natural resource management and counters the widespread perception that natural resources are either valueless or unlimited merely because they are available for “free” (without market prices). Properly assessing and valuing natural capital (both stocks and ecosystem services) and capturing that value in a natural-capital accounting framework can provide decision makers with essential information about the trade-offs involved in development decisions. They will thus become more aware of the socioeconomic implications of their countries’ use (or potential use) of natural capital, and better able to make informed decisions on that use—by whom, where, and to what extent. If properly designed and implemented, strategic investments in natural capital can be a means of tackling pressing environmental and social issues, such as climate change and energy, food, and water security. Such investments can encourage inclusive and sustainable growth, thereby supporting the livelihoods of the rural poor and increasing their access to economic opportunities. For example, payments for ecosystem services can encourage the rural poor to practice conservation by offering them incentives to do so. Land tenure reforms, especially those targeting marginalized groups, can stimulate local investment in courses of action that increase both productivity and resilience to climate change. A holistic framework can help policy makers develop policies to promote investments in protecting and enhancing natural assets, improving the efficiency of resource use, and mitigating the impact of economic activities on natural capital. tools to support decisions on natural capital-friendly policies and investments. Governments, the private sector, development cooperation agencies, and other stakeholders can take action to put the natural-capital investment framework into operation. Support the development of the underlying legal and institutional systems. Tailor messages on natural-capital investment to decision makers so as to establish the relevance of such investment to dealing with the major development challenges facing the GMS. Build technical capacity to develop and deploy valuation and mainstreaming tools and approaches, such as natural-capital accounting, valuation, and strategic environmental assessment. Confirm the benefits of natural capital through frameworks that address, among other things, the links between energy, food, and water security and ecosystem‑based approaches to climate change adaptation and mitigation. Mobilize public sector and private sector investment by strengthening fiscal and economic instruments targeting high-priority landscapes with rich natural capital and the supply chains for key commodities. Asian Development Bank. 2015. 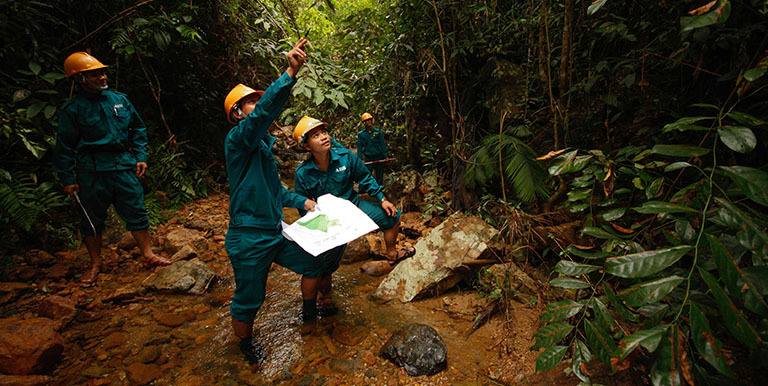 Investing in Natural Capital for a Sustainable Future in the Greater Mekong Subregion. Mandaluyong. Greater Mekong Subregion Core Environment Program. Natural Capital Dialogue.